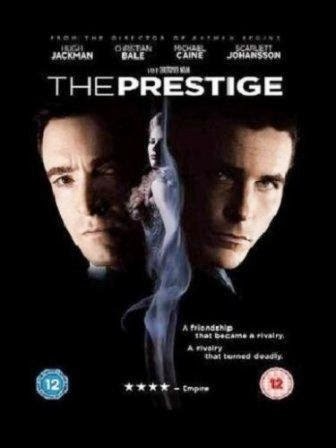 As part of Doing Dewey's Book to Movie Challenge I read and watched The Prestige. I knew nothing about the story beforehand and that's why I chose it - I wanted to be surprised. I certainly was! 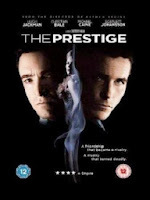 The Prestige tells the story of two rival magicians living in London at the turn of the twentieth century. Alfred Borden and Rupert Angier are dedicated to their craft and set on becoming the most successful illusionist the world has ever seen. They both long for fame and fortune, and their desire to create the best stage illusion means a feud develops between them as they each try to better the other. Borden's greatest trick is called 'The New Transported Man' and involves him transporting himself from one side of the stage to the other in only one second. Despite his knowledge of stage magic techniques Angier has no idea how Borden achieves this feat. His obsession with discovering his rival's secret so he can reinvent the trick himself and make it better leads him to America to meet with Nikola Tesla, renowned electrical engineer and inventor. With Tesla's help Angier develops an aparatus that allows him to create his spectacular illusion act 'In A Flash'. That's the basis of the story, and yet there is a lot more to it. In fact, this novel is multi-layered and the story quite complicated. It is full of twists and turns as well as a science fiction element. 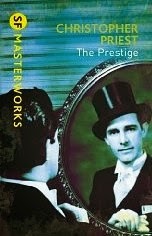 I adored this novel. There was so much to the story and it gripped me from the very first page. The story is intriguing, fascinating and tantalising. Priest does a great job at dropping hints here and there, but never revealed the real truths until the end. I loved the four narrative voices. Not only do Borden and Angier each tell their side of the long-running feud, but we also hear from their great-grandchildren Kate Angier and Andrew Westley (Borden's descendent) in the 1990s as they try to piece together just why this feud occurred and what the secrets were the two magicians kept hidden. Seeing the story from all these points-of-view meant I was left with a well-rounded account of the events. I liked this. This is one of those stories where saying too much in a review could give away the twists and secrets. What I will say is that the ending of the novel is quite creepy and terrifying to read. I was actually scared! But I found the book all the more fascinating because of this. A gripping novel. I had high hopes for this film because I loved the book so much. Plus I'm a huge fan of Hugh Jackman, Christian Bale and Christoper Nolan! After being thoroughly freaked out by the creepiness of the book's ending I couldn't wait to see that particular bit on screen. Alas, the screenplay turned out to be a lot different from the novel, and this scene didn't even appear in the story. Due to time constraints, the screenplay didn't include the 1990s story of Kate and Andrew. With a story that spans 100 years, I'm not surprised the film wasn't able to fit it all in. I understand why they decided to focus solely on the Borden/Angier feud, but that doesn't mean I wasn't disappointed. There seemed to be so much left out of the story that you could almost say it wasn't the same story at all. Yes the bare bones of the plot were there, but even so they changed many of the finer details. It's a good movie and I enjoyed watching it. There isn't really much Christoper Nolan can get wrong after all. :-) But having said that I did feel that with leaving so much out of the story the film lost its shine. Perhaps it was because I was already familiar with the twists and the secrets that the film wasn't able to surprise me. In that respect it left me feeling let down and nowhere near as thrilled as I was when I finished reading the novel. The film was well acted and it had a very dark edge about it, which was fantastic. I enjoyed seeing how they created early twentieth century London; the setting was brilliantly done. But unfortunately this adaptation fell a little flat for me. A good film, but not as gripping as the novel.